« *** WINNERS *** Lisa, Kristi, Tina, Danielle and Mercedes are Living the Life of Riley! CONGRATS! Barely a quarter of young people made it to the polls in the last midterm election, and Mary Jane McKittrick thinks it’s just not right. "In school, we teach them about the revolutionary war and all the wars our country has fought in order to protect our freedoms, so it doesn’t make any sense to me why young people do so little to participate in the democracy we teach them about every year in school," said McKittrick, author of the children’s book Election Day, part of the Boomer and Halley series (www.boomerandhalley.com). "I'm not sure what happens when kids turn 18 and decide they don't need to vote, but I think it’s a problem worth addressing." The statistics that worry McKittrick show that most midterm elections have traditionally drawn only 22 to 25 percent of voters aged 18-30. Keep in mind, that only tracks the number of registered voters in the mix, and doesn’t even tabulate the millions of young people who don’t even bother to register to vote. According to the figures compiled by The Center for Information & Research on Civic Learning and Engagement, a project by Tufts University, youth voting has been up slightly in presidential elections in recent years. In 2008, 51 percent of voters age 18-30 voted, up 2 percent from the 2004 elections. Still, such anemic voter turnout got McKittrick thinking about what needs to happen in order to turn those statistics around. "I believe that children need more than just a history lesson about democracy," said McKittrick, a former broadcast journalist who studied speech communication in college. "I think they need to be shown how the democratic process works and how people can make changes locally and around the country by raising their voices and availing themselves of their rights as citizens in a free and democratic society. More than that, I think parents should be more conscientious about teaching the importance of voting from a young age, so that it is a right and an action that kids look forward to taking. Our power in the voting booth is the single most significant individual power we wield as citizens and it’s a right that many around the world don’t possess. We should teach our kids to value it and to use it wisely." 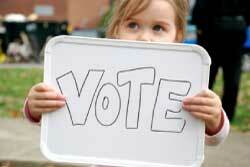 Vote – It’s difficult to teach your child about the election process if you don’t vote. You should make a point to vote, and when age-appropriate, bring your children with you when you do. If you vote via absentee ballot, show your child the form and explain how important it is to make sure your vote counts. Connect Laws to Their Lives – Children may not have a frame of reference for how a law is passed, but they encounter government in action practically every day. When there is road construction on the way to school, it represents tax dollars being spent to improve the community. When a new playground opens, or old equipment is replaced with new equipment, it can be traced back to the local government. When they see campaign signs all around during an election cycle, it’s another opportunity to explain what it’s all about. Don't Talk Politics, Talk Issues – Politics can be boring for kids, and they may not have a frame of reference for it. But issues, like whether the school year should be longer or why they take standardized tests at school, can be discussed easily because it’s relevant to their lives. Ask questions like, "Do you think it’s fair that the rules are this way?" or "If you could make the rules, what would you do?" It will get them thinking and caring about democracy and their role in it. 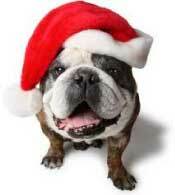 Keep Your Four-Legged Friends Feeling Fine ~ Follow These Five Tips for Holiday Pet Safety!